How do they do it? After yet another failed attempt at applying self discipline to change bad habits into good ones, you are confused and angry that it seems so simple for others to do! Why? Self-discipline seems to be the thing that everyone else has. But only a few are fortunate enough to be so self-motivated that self-discipline isn't necessary. If you struggle to stick to your goals for a healthier lifestyle or to help you carve more success into your career, you are not alone. But the good news is that you can learn from those people who make it look easy, and put some iron will into your limited reserves of self discipline. In the past if you failed you were considered weak willed, but science has shown that you actually only have limited reserves of self discipline, and that each time you draw on your reserve by making good choices, you are getting closer to running on empty... so its not really your fault when you run out of the motivation to say "No" or to go that extra mile. Self-discipline may seem like a simple thing... is the ability to do something that you don't feel like doing. And although we now know that each of us only have a limited supply, we have to learn the skills so that we can increase our capacity for self-discipline over time. There are plenty of good reasons to develop your muscles in this area, and increase your levels of self discipline. Those with high levels of self-control have been found to be happier than those with low levels. It's believed this is due to reduced internal conflict. Those with less self-control are constantly struggling to make decisions between competing goals. Those with more self-control make decisions more rationally and much more quickly. 1. Give yourself frequent breaks. Setting a schedule that's too aggressive will quickly drain your reseves of self-discipline. Give yourself regular breaks in your chores to ensure that you stay alert and fresh, making it more of a painfree 'no brainer' to stay on track. 2. Avoid waiting until you feel inspired to take action. With all the forms of entertainment and distraction we have available, it's logical to assume that we should feel inspired to do the things that need to be accomplished. But often you learn that developing a better quality of life and simple comfort are often at odds. Self-discipline can be used to engage in activities that aren't comfortable, but are necessary for your best future and happiness. Make sure your goals are big and attractive enough to INSPIRE YOU and make you WANT to take the actions you need... as only then will you enjoy a high quality of life. 3. Learn to complete tasks. Let finishing become your code. Become a finisher. Regardless of the task, see it through to the end. Is the dish rack full, but there are still a few more dishes to wash? Make room and get it done. When you start something, finish it. 4. Do the hardest thing first. Your self-discipline is highest early in day. Make the most of it by getting the big ugly hairy tasks done first, before you need to begin making excuses to let things slide. So get that tough item crossed off your to-do list as soon as possible. 5. Learn to stay with discomfort. Do you have the urge to go to the kitchen for a snack? Make yourself wait another 30 minutes. Often just delaying your gratification is enough to stop the craving or to motivate you to hang in there until the discomfort passes. Whenever you're feeling uncomfortable, make yourself stay with it just a little longer. Teach yourself that your discomfort is only a suggestion. You don't have to cave in. 6. Take time to enjoy yourself. This is the best way to replenish your willpower. Stress, hunger, and fatigue drain your ability to exercise self-discipline. So eat a good meal and get a full night of sleep. Take part in enjoyable activities. Ask yourself "how can I get this done and ENJOY the process more?". I promise you will surprise yourself with some of the answers you come up with! There are lots of ways to do the needful in more creative and fun ways and in new environments. Get creative. Reward yourself with every win. Write it down to celebrate at the end of each day. Promise yourself little rewards along the way to keep yourself motivated to stick to your promises to yourself. Whether the outcome is a shoveled driveway, a new bass boat, or a completed novel, be aware of the desired outcome. Be very clear about the BENEFITS to you of that outcome. Enjoy feeling how good it will feel when its done... visualize and mentally imagine it already done to feel the pleasure of a job well done. Self-discipline becomes easier when you're able to maintain a long-term perspective. Creating a habit of vacuuming the living room every Wednesday eliminates the need for discipline. So creating a schedule for "to-do" tasks that you struggle with is a great way to eliminate the effort of working out what to do each day, and trying to convince yourself it can wait another day. Just list out all the regular household chores and daily 'things' that you have to do every month and break it into daily chores. Set a day and time to 'just do it' so that you don't waste effort and time even just working out what needs to be done every day. Habits are powerful. Put yourself on autopilot and use the power of habits to your advantage. Studies have shown that mediation strengthens the part of the brain responsible for self-control. Buy a book or find a local meditation group. When you feel your resolve weakening, recite positive affirmations to yourself. Don't knock the power of positive words and thoughts! You will over time create a selection of positive affirmations that reflect your values and ethics and your beliefs about yourself that will shape your future! They are always useful to keep your mind occupied on something positive while you get your work done. Saves a lot of resentment, when you remind yourself that you CHOOSE to do this 'thing' and you are looking forward to the rewards coming to you. Success without discipline is a myth. Successful people appear to have ten times more talent than the rest of us, but successful people work very hard to be successful. The ability to control your thoughts and actions creates success. Hard work requires discipline, because it usually isn't fun. How much self-discipline do you have? Your level of self-discipline can affect your diet, health, fitness, finances, career, and relationships. 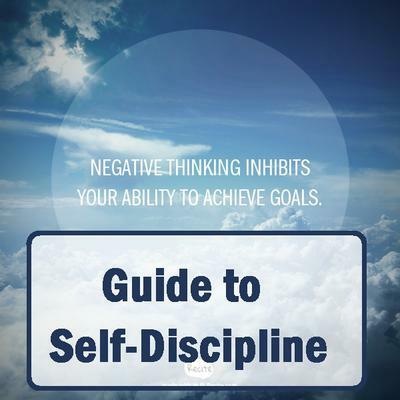 Self-discipline is a learned behavior, so you can develop your self-discipline if you choose. With enough self-discipline, you can achieve any goal! Did you find this post about how to make more progress informative and useful? If so, please share it with others! What is your favourite way to increase your self discipline or to stay motivated?